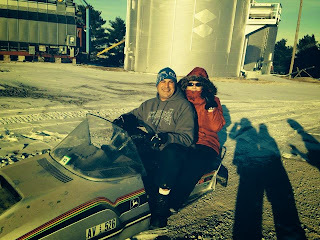 Here we are riding snowmobiles on the farm. You can see the silver grain bin in the background. 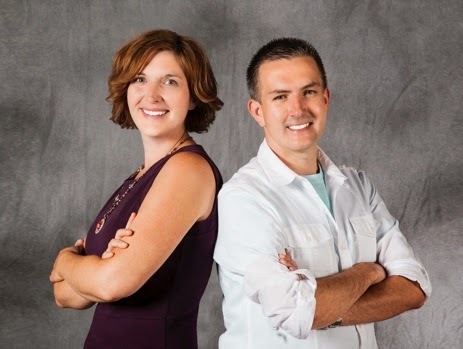 My husband was born in Iowa and then moved to Oklahoma when he was just a little guy but he has continued to go back to Iowa to visit his family. Almost all of his Iowa family are farmers. I'm talking corn and beans people and not just a little garden patch in the back yard. We head out and check the crops and we've taught our children how to drive at ages 12 and 13 on the farm roads. 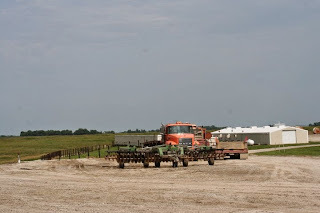 We love going to the farms and riding four wheelers, driving tractors or the gigantic combines and just enjoying farm life away from the city noise and traffic. I was so excited to see this series about tractor. 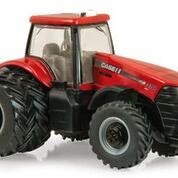 Even though my son Kylan is getting older he still wanted to look at the book and he brought up the fact that most of the tractors we've seen are green and not red but I told him I think it's just a different brand. Anyway, I hope you enjoy the books as much as we are! Literature for little tractor fans just got smarter. A new series brings children interested in farming and farm equipment an educational and entertaining look at how tractors, combines and tillage equipment operate together on the farm. 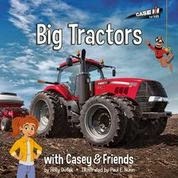 Published by Octane Press, an independent publisher known for award-winning tractor books, the Casey & Friends series uses photographs of CASE IH equipment in real farming situations with cartoon characters to explain how modern farm equipment works in a factual and fun way. Holly Dufek, a seasoned educator and national curriculum writer, joins Pixar “Cars” artist Paul Nunn to help kids make the connection with the farm equipment they see in the countryside and the food on their table. 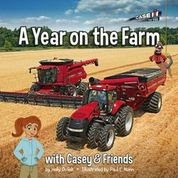 Readers follow Casey the farmer, Tillus the worm, Big Red the tractor, and a whole cast of cartoon equipment characters who teach important life lessons gleaned from the farm, like thinking ahead and working as a team. 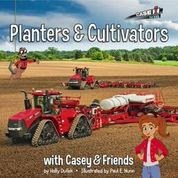 Each title is licensed by CASE IH and highlights a different aspect of farm equipment and technology with educational sidebars, picture glossaries and fun farming facts for added learning possibilities. A Year on the Farm (Jan. 2015) introduces children to the world of modern farming by teaching them about the different jobs a farmer does each season. Casey and her team show how tractors, combines and other equipment: plant and harvest crops, work in the farmyard, and care for animals. Learn how farming involves planning for the year, reacting to the weather, and working as a team. Big Tractors (Apr. 2015) shows how the biggest, most powerful tractors handle the demanding jobs of pulling and powering on the farm. Find out how Big Red and Sammy – the biggest tractors on the farm – use their powerful muscles to work in the field with the rest of the team. Learn about the science of farming and discover how advanced technology makes Big Red and Sammy special. Combines (June 2015) explains the step-by-step processes used to harvest crops by the most complex machines on the farm. 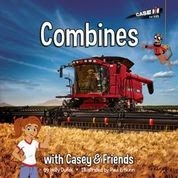 Follow Cody and Kellie—the combines of Happy Skies Farm—as they do the work of three machines: gathering, separating, and unloading grain and corn. 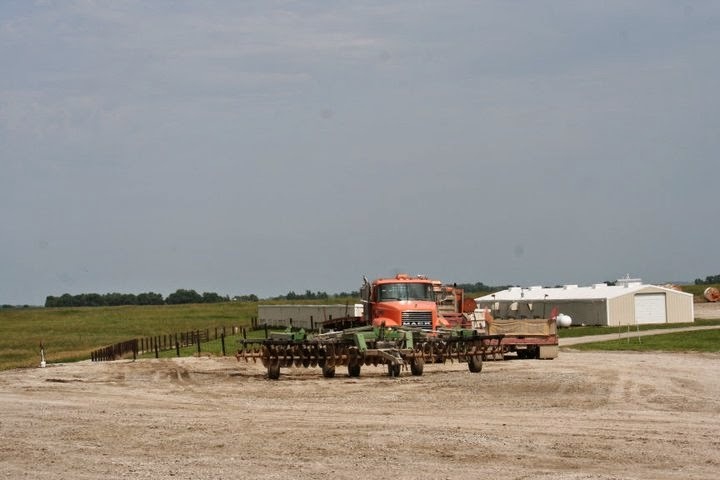 Planters & Cultivators (Sept. 2015) features the specialized farm equipment used to cultivate, plant and spray crops. Learn how Tammi the Tiller, Evan the Early Riser Planter and Peter the Patriot Sprayer work together to make this year’s crop bigger than ever. Explore the science of soil and discover how Casey’s team keeps it healthy.